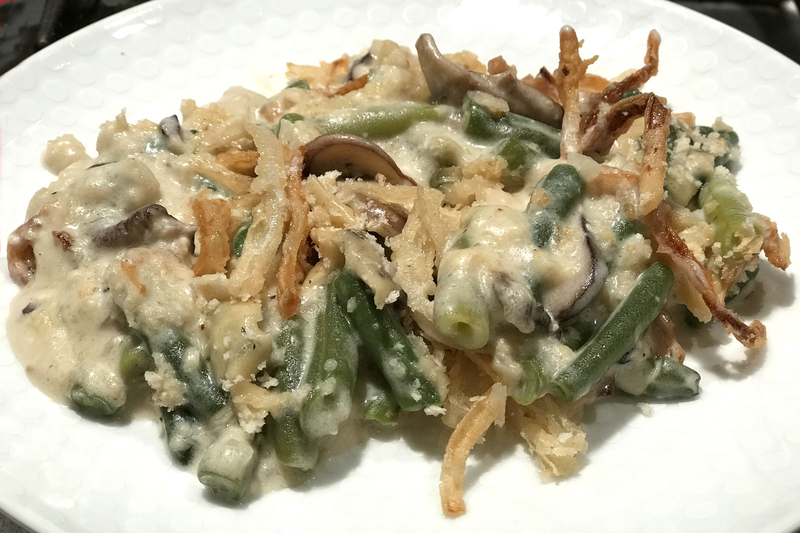 Who doesn't think that green bean casserole is one of the best things about Thanksgiving dinner? In this post, Chef Richard Erickson shares his secrets to making the most delicious version you've ever had. Enjoy! Your friends and family will love you for making this. What would Thanksgiving dinner be without the classic Green Bean Casserole? Like many, I grew up on the Campbell’s Mushroom Soup version of this dish, which I absolutely adored. In fact, we looked forward to eating this almost more than the turkey. My mother only made it for Thanksgiving, but our whole family would have gladly eaten it year-round. As a chef who makes just about anything and everything from scratch, I just couldn’t bring myself to open a can of Campbell’s, so here is the crowd-pleasing version we’ve been making for our Thanksgiving dinners at Bistro-to-Go for many years. We hope you and your family enjoy it. In a large pot of rapidly boiling salted water add the green beans and cook for about 6 minutes, or until they are fully cooked but still maintain a bit of firmness. Drain and cool under cold water until room temperature, then cut into approximately 1 to 1 1/2 inch size pieces and set aside. In a medium-large sauce pan add the butter and then the onion, cooking over medium heat for 3-4 minutes, stirring so as not to brown the onions. Add the mushrooms, season with a bit of salt, and cook for another 3-4 minutes. Now add the flour and stir until it is completely absorbed by the butter and has coated the onion-mushroom mixture. Begin to add the milk, 1 cup at a time, stirring well after each addition. When all the milk has been added continue stirring and season with a bit more salt and the nutmeg. Add the cream cheese in bits and continue stirring until bubbles start to appear on the sides and the cream cheese has totally melted, about 3-4 minutes. Remove from the heat and add the grated cheddar cheese and pepper to taste. Add the green beans, mixing well and with a rubber spatula scrape into a lightly oiled 9”x13” casserole dish. Place in the oven and bake for 25 minutes, or until bubbles have just started to appear around the sides. Remove from the oven and in a small bowl, combine the garlic and panko bread crumbs mixing well, then sprinkle over the top of the casserole. Raise the temperature to 375° and return to the oven for 12-14 minutes or until the top is crispy and lightly browned. You will need a large cast iron skillet. Add canola oil to a depth of about 1 inch. Heat the oil to 350°. Thinly slice 1 or 2 yellow onions into rounds. Cover them with 1 cup of milk for 5 minutes or so. Using a fork, gently remove and dredge in flour to coat, then drop into the hot oil frying in batches until golden brown, about 3-4 minutes. Remove to drain on paper towels or a cooling rack. Season with a bit of salt and garnish the casserole generously to serve. Want more Thanksgiving recipes? Our Feel Good Food Cookbook is chock full. Get your copy today right here.